Start Smart Baseball (ages 2-5 with parent participation), Start Smart Baseball is a developmentally appropriate introductory baseball program for children 2-5 years old. $55.00 includes 6-week session & equipment to take home. Please call 311 or recreation center to register, ask for barcode #6392. Family Game Night on Friday, April 23 will include bingo! Games will be free, but if you wish, please bring a small prize ($1 or less) to donate to the prize pile! Saturdays are perfect for family sports! Saturday mornings, 9:00 AM-Noon, are family basketball times, Saturday afternoons, 12:30 PM - 4:30 PM, are for badminton. Under 18 is free, while over 18 is only $2.00 per day or $41.00 for an adult annual pass. Zumba - Latin-inspired fitness to you moving! Tuesdays, 6:00 PM, $5.00 per week. 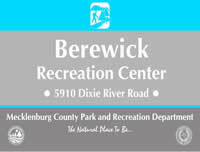 For more information, contact Carla Platter at 704.432.4934 or Carla.Platter@MecklenburgCountyNC.gov or visit the Berewick Recreation Center web page.